This one of those sweet and cute stories which makes you fall in love with both the characters and the setting (even if it is a small town in the middle of nowhere. 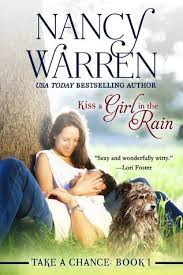 It was my first time reading a book by Nancy Warren and I found that I loved her writing which was seamless and flawless. It was a unique to story of a man (who is practically having a mid life crisis), that realizes that he is not where he pictured himself to be at thirty five. I loved the depth involved in Evan's character because Nancy gave us a glimpse into his family life, love life and professional life before starting his journey. The characters in the book are very likable and this enables the reader to connect and get involved with them very easily, which is not something easy for a writer to achieve. The chemistry between Evan and Caitlyn was good and the funny banter keeps you interested throughout the entire book. I did wish that the book was longer and that I got to see more of Caitlyn's life before Miller Pond, but nevertheless this was a great book and I look forward to the rest of the series. Evan Chance, a successful lawyer at one of the top law firms at Seattle, receives a wake up call when his mentor dies. He realizes that he is not the person he had envisioned and then sets out to complete a bucket list that he had written when he was twelve years old. Evan's journey begins with a motorcycle ride across America. Caitlyn Sorenson, is a doctor in a small town called Millers Pond. She meets Evan after he ends up in an accident with a dog, this results in Evan being stuck in Millers Pond for a few days while his bike is being fixed. After spending hot nights together, will Evan and Caitlyn be able to face the reality of their lives and love?